Super Shot is a basketball arcade game rental that offers 4 different options of Game Play; Continuous, Push-Back, Classic and Random. 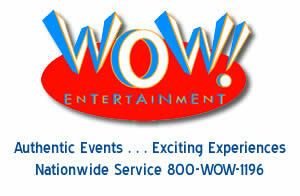 These options are set programmed prior to a trade show or event activation. The most popular option of Game Play is the Classic. In this format, the basket stays in a fixed position until the last few seconds of the game play. 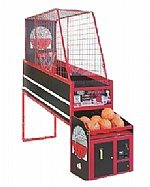 At that time, the basket moves to the back of the Super Shot Basketball game which creates a longer shot. in the Continuous mode, the basket moves back forth during the entire game play. The Push-Back mode the basket moves in slight increments after each basket is made and lastly in the Random mode, the basket moves back & forth randomly. 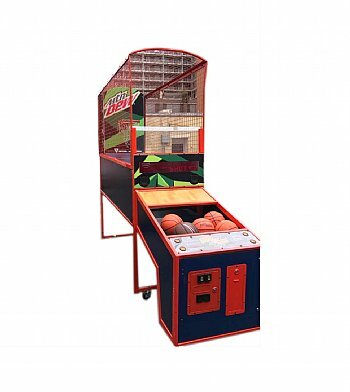 This basketball arcade game rental which is similar to Hoop Fever in many aspects can be set on free play or to accept tokens. One option available on Super Shot is determining the duration of the time to play. This is a very important option. 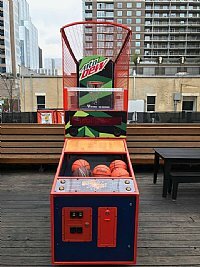 For example, if your trade show or activation has a significant amount of patrons by reducing the amount of time to play from 60 seconds to 30 seconds will greatly increase the throughput of this basketball arcade game rental. Super Shot offers numerous branding opportunities. These include the side panels, the backboard as well as the front area. Please contact a WOW Entertainment event specialist at 1-800-969-1196 to discuss the numerous ways that this basketball arcade game rental can be branded.